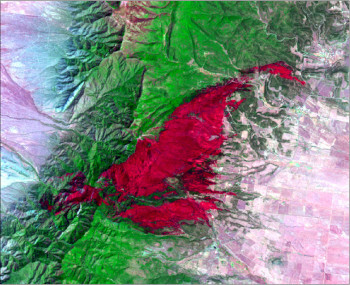 MTBS burn severity image from the 2008 Trigo Fire in New Mexico. Monitoring Trends in Burn Severity (MTBS) is an interagency program whose goal is to consistently map the burn severity and extent of large fires across all lands of the United States from 1984 to present. This includes all fires 1000 acres or greater in the western United States and 500 acres or greater in the eastern Unites States. The extent of coverage includes the continental U.S., Alaska, Hawaii and Puerto Rico. The program is conducted by the U.S. Geological Survey Center for Earth Resources Observation and Science (EROS) and the USDA Forest Service Geospatial Technology and Applications Center (GTAC). MTBS was first enacted in 2005, primarily to meet the information needs of the Wildland Fire Leadership Council (WFLC). The primary objective at that time was to provide data to the WFLC for monitoring the effectiveness of the ten-year National Fire Plan. The scope of the program has grown since inception and provides data to a wide range of users. These include national policy-makers such as WFLC and others who are focused on implementing and monitoring national fire management strategies; field management units such as national forests, parks and other federal and tribal lands that benefit from the availability of GIS-ready maps and data; other federal land cover mapping programs such as LANDFIRE which utilizes burn severity data in their own efforts; and academic and agency research entities interested in fire severity data over significant geographic and temporal extents. MTBS data are freely available to the public and are generated by leveraging other national programs including the Landsat satellite program, jointly developed and managed by the USGS and NASA. 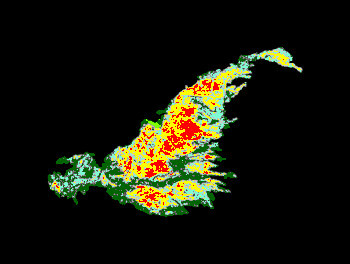 Landsat data are analyzed through a standardized and consistent methodology, generating products at a 30 meter resolution dating back to 1984. One of the greatest strengths of the program is the consistency of the data products which would be impossible without the historic Landsat archive, the largest in the world. MTBS post-fire image from the 2008 Trigo Fire in New Mexico. MTBS data products have been utilized for a wide range of both research and operational support projects during the past two decades. They provide a unique historical record of high spatial and thematic resolution data consistently characterizing post-fire effects for documented and mappable large fires in the US from 1984 to the present. Please check for the latest announcements! Download the MTBS Overview paper here.